Bloom's Digital Taxonomy updates Bloom's Revised Taxonomy for the digital age. It takes the elements of Bloom's Revised Taxonomy that were not applicable to a world filled with media and Web 2.0 technology and revises and updates the terms for the new resources available to educators, preparing students for a digital world. Bloom's Digital Taxonomy isn't about telling teachers what types of technological tools to use in your classroom. It's about learning what to look for when designing instruction. 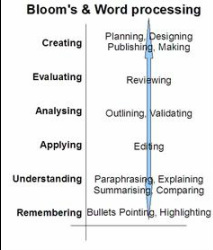 The cognitive levels present in Bloom's digital taxonomy are just as valid whether you are teaching using a brand new web 2.0 app or asking students to craft a poster for a class presentation. The following presentation describes the relationship between Bloom's Technology, Bloom's Revised Technology, and Bloom's Digital Technology. Below the presentation are summaries of the six areas of Bloom's Revised Taxonomy and the additional skills referenced through Bloom's Digital Taxonomy. For more information see Andrew Churches's wiki at Educational Orgami . 1. Remembering--Retrieving, recalling, or recognizing knowledge from memory. 1. Remembering--Use digital means to find, record, organize, manage, and retrieve important and needed resources through bullet pointing, highlighting, bookmarking, social networking, social bookmarking, and searching. 2. Understanding--Relationships are built and knowledge is linked through understanding through interpreting, summarizing, inferring, paraphrasing, classifying, comparing, explaining, and exemplifying. 2. Understanding--Constructing meaning from different operations both written or graphic. Included in this category are advanced and boolean searching, blog journaling, categorizing and tagging, commenting and annotation, and subscribing. 3. Applying--Carrying out, using, executing, showing, or exhibiting. 3. Applying--Learned material is used in productis like models, presentations, interviews, and simulations. Running and operating a program, playing a game, uploading and sharing, hacking, and editing are included in this category. 4. Analyzing--Breaking material or concepts into parts and determining how the parts relate or interrelate to one another or to an overall structure or purpose. 4. Analyzing-- Digital skills that fit analyzing include mashing, linking, reverse-engineering, and cracking. 5. Evaluating--Making judgments based on criteria and standards through checking and critiquing. 5. Evaluating-- Blog/vlog commenting and reflecting, posting, moderating, collaborating and networking, testing, and validating the accuracy of information. 6. Creating--Putting the elements together to form a coherent or functional whole. 6. Creating--Programming, filming, animating, videocasting, podcasting, mixing and remixing, directing and productin, and publishing.